Results for Cross Country League Finals can be downloaded from the Handout page. 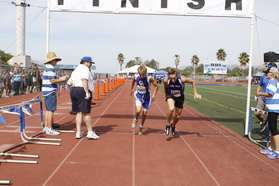 Villa Park Preview, Dana Hills, Woodbridge, and Lowell results are up on the Results Page. The full results can be seen on the links to the meets below. Full Preview results can be downloaded from the Handout page. Thank you to everyone who has donated money to the team. Especially those who gave more then asked for. Please take a moment to go to the Sponsor page to appreciate them. 2013 Uniform Order Form Is Available In Handouts. Below is the 2013 Schedule and links to the meets. If you have some good pics you would like put up, email them to me and I will. If there is a pic up you really like, email me and I can send you a full size copy of it. The pics here are small to save space. If there is a pic of you that you don't like, email me and I will remove it. Check out the Locations Page. There are directions to meets and off campus practice sites. Check out the Event Page. The whole summer workout is listed. As races get near, I will try to list bus and event times. Please keep in mind that sometimes the coaches will not know until the day before. If there is anything listed of you that you do not want on the site, is incorrect, if you use a nick name, have a good pic to post, or have any comments, let me know. My email and Coach White's email is listed below. If your name is misspelled email Coach Sitner with the correct spelling. My number is 714 4649979. Thank you everyone who gave PICs for the site. Mrs. Dismang, Mr. and Mrs. Miller, Martin, Courtney, Mrs. Rice, Mrs. Horist, Mr. Weeks, Mrs. Hudson, Mr. and Mrs. Ewing, Mr. Lizarraga, and Tegan.